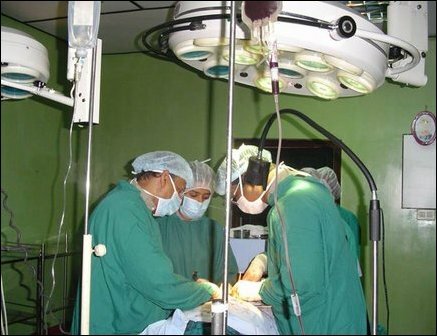 Doctors, both foreign and from Tamil diaspora, have been visiting hospitals in the NorthEast, often bringing new medical equipment and training local medical practitioners with invaluable surgical knowledge and other medical diagnostic skills. Dr K Sivapalan, Medical Director at Dr Ponnampalam Memorial Hospital in Puthukkudiyiruppu, Mullaitivu district, himself has been to U.S for four weeks recently looking at different medical facilities, is keen to capitalize on and encourage diaspora interest to develop his hospital into a premier medical institution in the NorthEast. 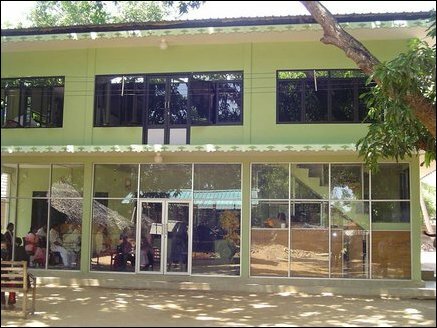 The Puthukkudiyiruppu hospital which started functioning in 1996 was named after Dr Ponnampalam who was well known for his dedicated services in Jaffna district during the war years. The hospital which now serves more than 100 patients a day, admits 15 to 20 patients a day, and conducts about 30 major, 70 minor operations a month, is now being extended with additional buildings. Patients waiting outside in the shade to gain entrance to the hospital. 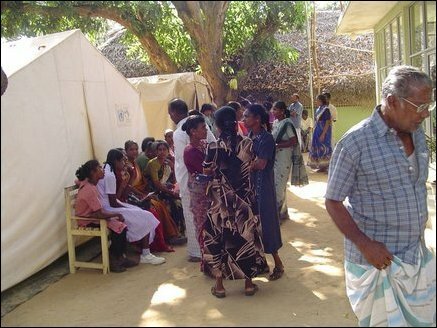 Temporary tents provide additional room for the new influx of patients after the tsunami. 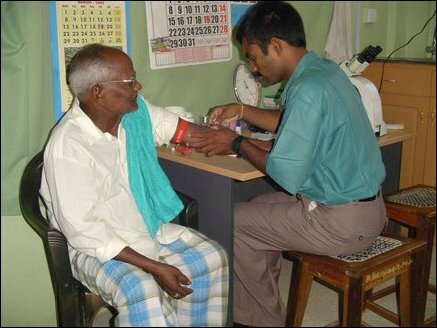 Locally trained lab technician prepares to get blood sample from a patient in a well equiped laboratory. Air-conditioned main operating theater , one of two in the hospital. 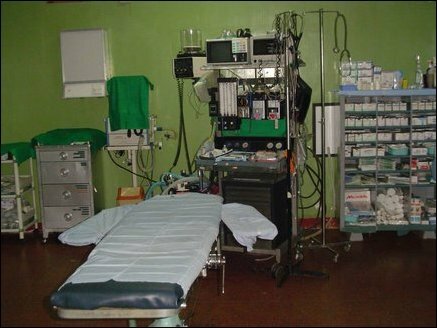 In addition to the Surgical tools and sterilization equipment and anesthesiological equipment are available that allow major surgeries to be performed at the hospital. 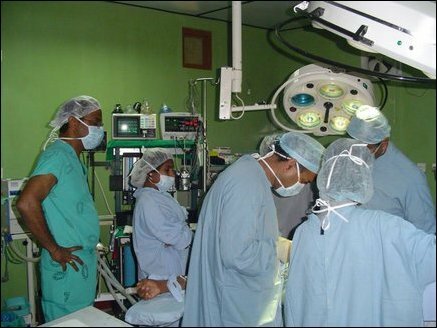 Dr Sivapalan leading a surgical team. According to Dr Sivapalan the Hospital only charges patients who can afford. Most of the services performed by the Hospital are therefore done free of charge. 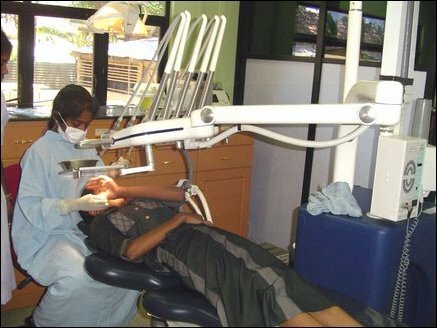 Ponnampalam Hospital has a well equipped dental laboratory where typical regular cleaning sessions and fillings as well as more complicated surgical procedures are performed. 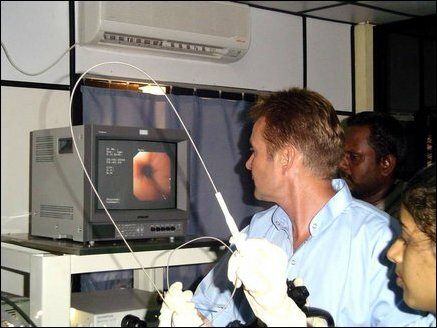 Norwegian gastro-enterologist Per Arthur Johansson visited Dr Ponnampalam hospital and trained nurses and doctors on the use of equipment and diagnostic techniques. 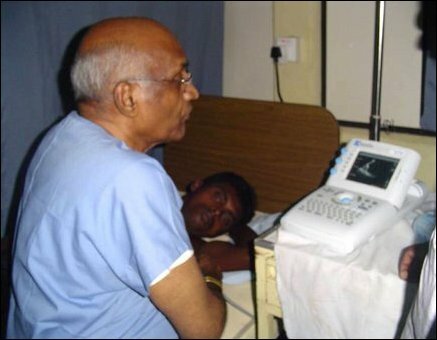 Cardiologist Dr Shan K. Sundar from California is a regular visitor to Vanni medical facilities to train and help advance treatment of heart conditions. 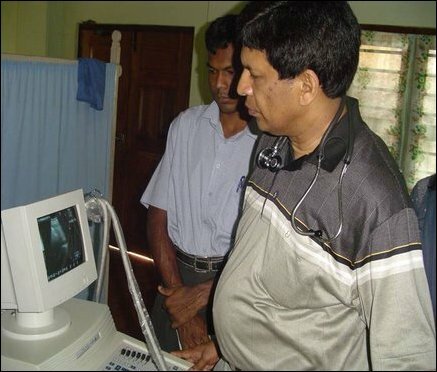 Gynaecologist Dr Navaneethan assisting local medical staff. 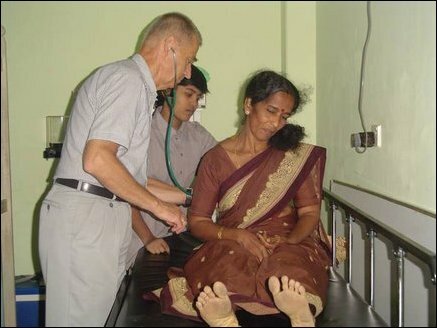 Cardiologist from Australia, Dr Manomohan visiting Ponnambalam Hospital to train the local staff and perform operations. Dentists Sivakanesan and Sivapiran from Norway working with a patient to train local medical practitioners. 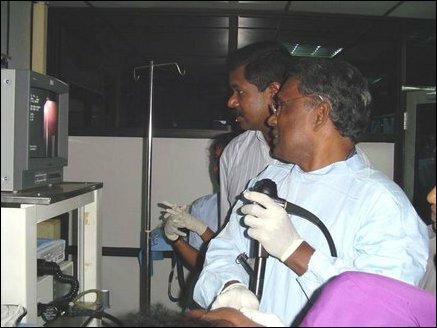 Dr Moorthy, a Gastro-enterologist from California, USA helping Dr Sivapalan in diagnosing a patient. 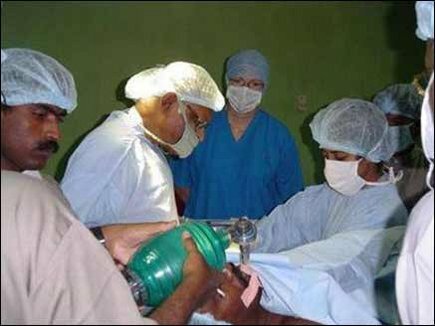 Dr Ganenthiran, an anaesthesiologist, helping in a surgery at the hospital. 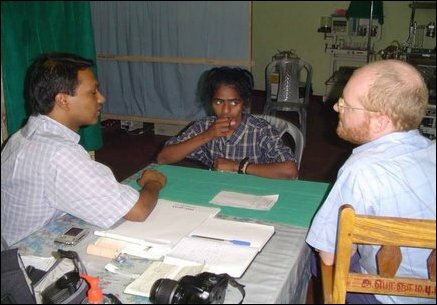 Dr Robert Benjamin, an ENT surgeon from New Zealand examining a patient in Ponnambalam Memorial Hospital. Norwegian nephrologist Dr Fauchald is a regular visitor to Ponnampalam hospital to impart his expertise in kidney relate disceases to local doctors. 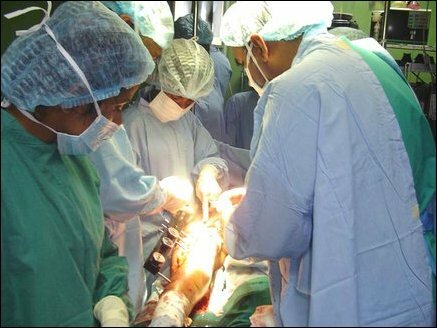 Orthopaedic Surgeon from Malaysia, Dr Sivananthan, performing surgery on fractured leg of a patient. 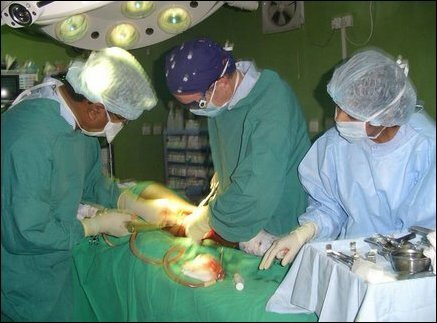 Australian orthopaedic surgeon, Dr Chris Robert, using the hospital surgical facilities for an operation. 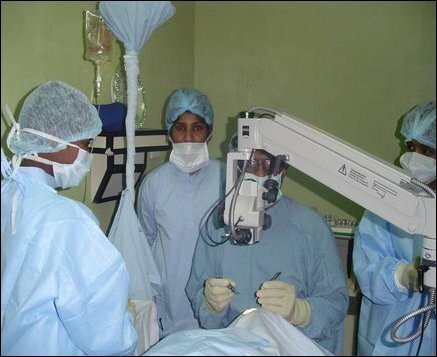 British eye surgeon, Dr Puvanachanthiran, helping staff with the intricacies of performing eye surgery. Norwegian plastic surgeon, Dr Louis de Weerd, talking to a patient on the needs for performing a plastic surgery to correct facial deformity. 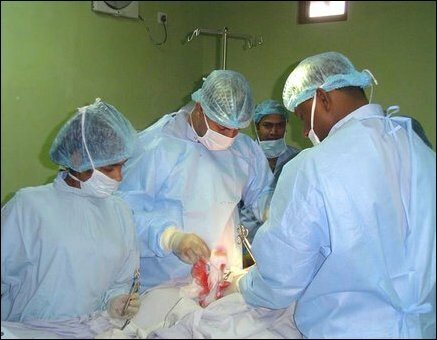 Dr. Charles Vivekanandan, a Plastic Surgeon from UK, performing surgery on a male patient. 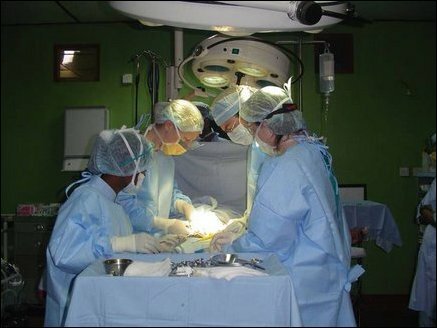 Plastic surgeon from UK, Dr Philip Grey, determining the surgery required to help a female patient. 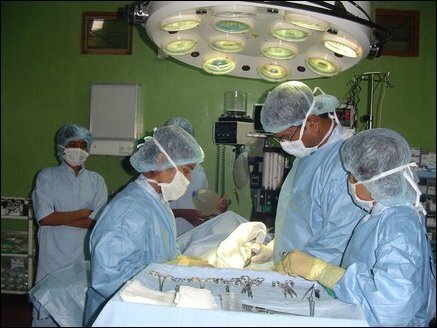 Surgical team from Stanford University, USA, working at the Dr Ponnambalam Memorial Hospital, helping to impart their medical knowledge to local doctors. 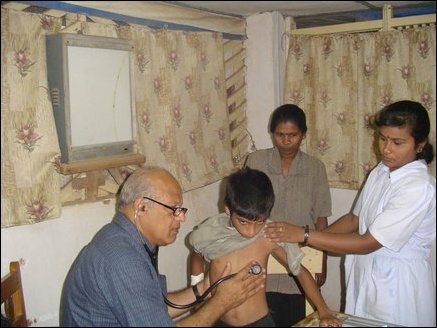 Dr Karunyan Arulanandam, a Paediatrician from Calfornia USA, examining a child while a local nurse helps out. 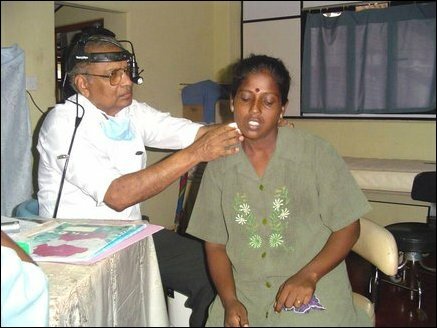 Dr Jeyalingam, an ENT surgeon from New York examines the eyes of a female patient at the Dr Ponnambalam Memorial Hospital.